CHICKASHA — In the early morning hours of Jan. 28, Chickasha Police requested the assistance of the Oklahoma State Bureau of Investigation in the murder investigation of 18-year-old Arnold Adams III. So far in the investigation six co-defendants have been identified. Four were taken into custody: Troy Jennings, 19, of Mcloud; Brooklyn Nelson, 16, of Oklahoma City; and Vivian Sanders, 15, of Newalla were booked into the Grady County Jail. 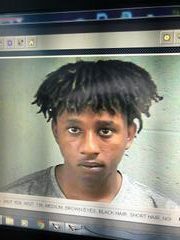 Montana Simpson, 15, of Norman was booked into the Caddo County Jail. All four were held on first-degree murder complaints. Arrest warrants for first-degree murder were issued for two suspects: Dmillion Williams aka NinePoint, 18, and Malcolm Jackson, 18, aka Highlife, have not been captured yet. They are to be considered armed and dangerous. If you have any information pertaining to their location please call the OSBI at 800-522-8017 or call the local police. Please do not approach them.